Vergne joined the Red Bull junior team very early in his racing career, and that helped him move up to Formula One with Toro Rosso. He was overlooked by Red Bull for the seat at the main team in 2014, leaving the Frenchman at Toro Rosso for a third consecutive season. He was in the running for a move to the big team again but found himself without a seat for 2015. Instead, he moved to Ferrari as a test driver. Jean-Éric Vergne first started karting at the circuit owned by his father in France. He moved through the karting levels until he was ready to join the Formula Renault series in 2007. At the end of the year, after impressing with plenty of podium finishes, Vergne joined the Red Bull Junior team. After more Formula Renault variations, he moved to the British Formula Three series in 2010, racing for Carlin. He secured the title that year, winning a good percentage of the events. At the end of the year, Vergne tested for Toro Rosso at the young driver event in Abu Dhabi. He impressed enough to be granted the opportunity to run in free practice during race weekends in 2011, and then after another young driver test appearance, he was signed to the Toro Rosso team for the 2012 season. His first year in the sport was dominated by poor qualifying performances, with Vergne himself admitting he needed to work on his Saturday results. He was retained by Toro Rosso in 2013 and continued to perform and improve. When Mark Webber confirmed he would be retiring and leaving a vacant Red Bull seat behind him, Vergne was briefly in the frame for the promotion. However, the team soon revealed they weren’t considering the Frenchman, instead concentrating on his teammate Daniel Ricciardo – who went on to get the seat. Despite being overlooked for the step up, Vergne remained at Toro Rosso for 2014, for his third year with the team. It was a similar story that season, with Vergne performing well and holding his own against the competitive Daniil Kvyat. However, he was left without a race seat for 2015, and moved to Ferrari to become test driver for the Italian team instead. Alongside his test driver duties, Vergne joined the Formula E series, racing in the inaugural season of 2014/15 and remaining for the following three years. Learn more about Jean-Éric Vergne with the Pocket F1 Handbook. Heidfeld had a bit of a meltdown yesterday, he was following Jean-Éric Vergne for the final few laps of the race and desperately looking for a way to get past. Immediately after the race, where he finished third, he was complaining about Vergne's defensive actions, saying he was driving illegally. He said he was FURIOUS. Jean-Éric Vergne: "I did not fully understand everything about that race. I think I had a huge issue in the car, all the strategies were wrong, no communication... It was just a nightmare race, but a nightmare race finishing second is a really good thing. So I'm happy about that." Jean-Éric Vergne took pole position for the race today, ahead of Sam Bird. Heidfeld, Abt and Rosenqvist also took part in the super pole shoot-out, and it was incredibly close. The top three were split by just 0.029 seconds! 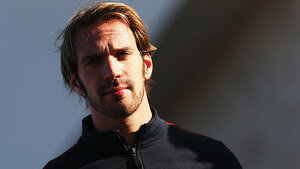 Jean-Éric Vergne: "The car was just impossible to drive for me. It is not an easy track, there is a few corners where if you don't have the right balance you lose a lot of time, and that's what happened. I think we're struggling with the tyres, the problem is I drive with a setup that was never mine, so I don't know how the car will be. It would be better if I could drive P1 and P2, then I could set up the car properly. Not getting out in P1 makes it difficult but not getting out in P2 makes it impossible. :"
Jean-Éric Vergne slip-slides his way around a lap to improve but only to 15th which is still in the drop zone. Drop zone currently features: Pastor Maldonado, Romain Grosjean, Jean-Éric Vergne and Sebastian Vettel. Incident involving Romain Grosjean and Jean-Éric Vergne will be investigated after the race - forcing another driver off track. 5 second stop/go penalty for Pastor Maldonado, Esteban Gutiérrez and Jean-Éric Vergne - speeding behind the safety car. Incident involving Esteban Gutiérez, Jenson Button, Pastor Maldonado and Jean-Éric Vergne under investigation - speeding behind the safety car. Kimi Räikkönen was looking for a way past Jean-Éric Vergne, but the Toro Rosso driver heads into the pit lane. Sixth place on the way in, a quick stop, and 14th place on the way out, ahead of teammate Daniil Kvyat.